Small size, essential but complete in detail. It can be used as a comfortable chair, or, if the size of the toilet and the size of the room allowS it, directly onto the toilet. Small size, essential but complete in detail. It can be used as a comfortable chair, or, if the size of the toilet and the size of the room allows it, directly onto the toilet. Foldable armrests to ensure maximum comfort in side movements. 4 swivel wheels, 2 of which have parking brakes. Quick-release footrest pedals. 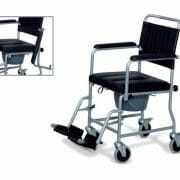 Footstools, adjustable in height, foldable, complete with fixed-heel straps. 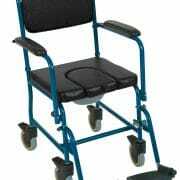 Backrest with push handles for assistance.